The threat of further strike action by the RMT in its long-running dispute with Southern Rail over the planned extension of driver only operation (DOO), originally planned for 4 April, had the salutary effect of forcing management to renew talks on that day. 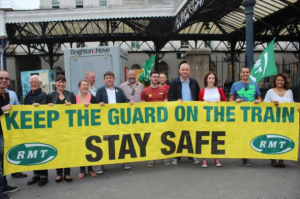 However, continued pig-headedness on the part of management made it necessary for the strike to go ahead on 8 April, in tandem with strikes on Merseyrail and Northern. The bloody mindedness of both Southern, Merseyrail and Northern management over the DOO issue is clearly being backed up with more than a nod and a wink from the government. Further evidence of this comes in the form of the government-backed ‘Rail Capability Plan’. According to the plan, ‘semi-automatic’ and DOO are just the first two of a series of ‘milestones’, to be followed by ‘unattended operations’ and finally ‘autonomous’ trains. The crowning glory is supposed to be ‘intelligent trains’ which will “reduce the reliance on complex and expensive rail infrastructure and control systems and through automation transition the role of railway staff from direct control and operation to supervision” (‘RMT warns of co-ordinated Government plans to axe rail staff’, RMT Press Office, 21 March 2017). Whilst under socialism such promised technological marvels could offer real benefits to society, under capitalism it will be about nothing but ‘transitioning’ workers onto the dole queue whilst squeezing more corporate profits out of a corner-cutting rail industry.